Provides oil refinery plant,solvent extraction and more informations about oil refinery plant cost and types of cooking Oil . The oilseed requires undergoing a thorough cleaning process to remove sand, stalk, plant debris and any other foreign matters by rotary or table sieve. Usually, the screening process is assisted by cleaning sieve. Post cleaning, the seeds have to be prepared for efficient oil recovery by pressing. The stages involved are size reduction of the seeds by breaking them and then conditioning the seeds by adjusting their moisture content and temperature, while keeping the seeds hot (say 90-95oc) for a period of 30-60 minute. Then the prepared seed shall be conveyed to the screw oil press machine where it is pressed by the action of worm and outer shell. The crude oil so obtained from the pressing will be first clarified in a settling tank and then shall be pumped through the oil filter machine. The filtered crude groundnut oil will be pumped to the edible refinery machinery where it shall pass through three stages of refining: neutralization, bleaching and deodorization. Neutralization : To reduce the level of free fatty acid (FFA) in the oil, caustic soda is mixed with the crude oil and the mixture is fed to a hydration tank. The neutralized oil may have trace of soap which is a by-product of the neutralization process. Therefore, the oil will be washed with water. 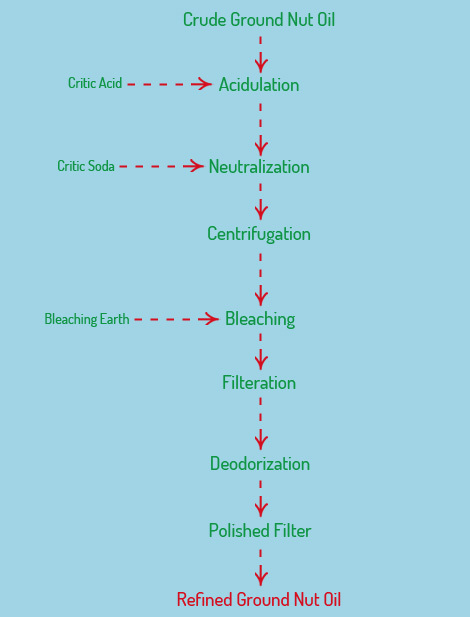 Bleaching: The neutralized oil is then pumped to the bleacher in which it is mixed with bleaching earth to improve the color of oil by the process called adsorption. At this stage, any undesirable impurities from the crude Groundnut oil are removed. This process improves the initial taste, final flavour and oxidative stability of the product. The bleached oil is then filtered to remove the bleaching earth leaving the oil with very low phosphorous levels and no soap. Deodorization : The bleached oil, after being filtered, will be pumped to the deodorizer to avoid substances which are responsible for the odor of edible oil. This entry was posted in Oil Refinery Process. Bookmark the permalink.